Sunday 07th August 2016 morning service proved to be a service loaded with surprises and good news. 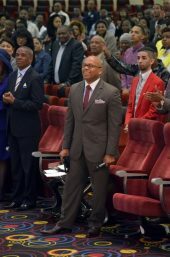 After being away the father of the House Bishop H.F. Edwards was in back home and it was a pleasant surprise for many who had not expected him for another week. 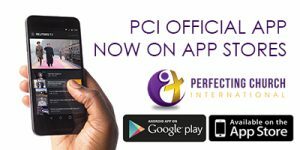 As it is custom the Perfecting Choir were in service as they ministered greatly as confirmed later on by the program director’s words Dr. Thuli as the best choir ever. 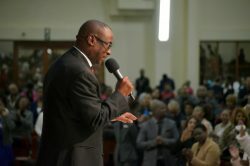 Minister Malcolm took to the stage to receive the Tithes and Offering and charged the congregation with a word “Dealing with the root to affect the Change” where he concluded by stating that the three fundamental things that keep people from giving are Debt, Overspending and Overindulgence. He said the actual financial state of every believer is determined by their contentment in the state they are in currently. As August is Women’s Month in South Africa, the Women through the Women’s Ministry’s, “Pearls of Worth”, HOD Mrs. Lorna Smith, were given an opportunity to address the congregation. 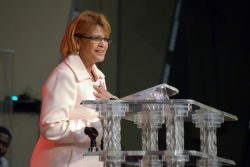 Mrs. Lorna Smith stood by the pulpit with poise and finesse as she delivered her speech which she later explained that she had drawn inspiration from her late Mother, Mrs. Nellie Gouws, The Holy Spirit and Internationally acclaimed speaker, best-selling author, and co-founder of Messenger International, Mrs. Lisa Bevere. 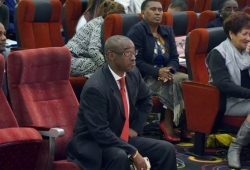 Soon after sister Lorna Smith gave her speech, sister phumza also said a Poem to the congregation, the father of the house, Bishop H.F. Edwards climbed the altar, gave a short charge before introducing the guest speaker, a Spiritual son to Bishop TD Jakes of Potters House. 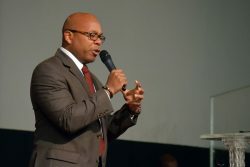 The guest speaker who is the Campus Pastor of Potters House Fort Worth, Pastor Patrick E. Winfield II, when called up to the altar, you could see he was charged up and prepared to deliver a message as a man on a mission. After appreciating the Angel of the house, the leadership of the Church, the band and the choir, he asked everyone to stand for the reading of the Word which was from the book of 1 Chronicles 13:1-14 and 1 Chronicles 15:11-14. He then introduced the title of his message by informing the congregation that he will be speaking on “An Ordered Strategy of God”. He began by saying all those involved in God’s plan only need a strategy to move from a place of being inspired to a place of manifestation. 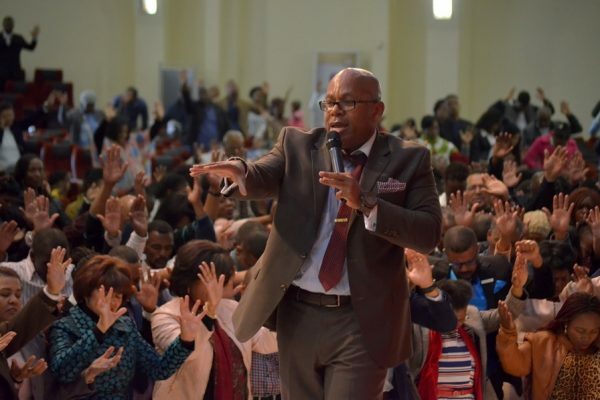 Pastor Patrick said God is a God of order, He may speak into chaos, He may hover over chaos and He may even allow chaos in a person’s life, however there would be order in that chaos, but God Himself does not work in Chaos in His mind . He said God allows chaos in people’s lives so that they may desire order. 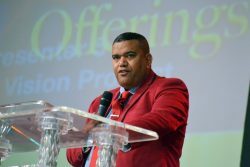 Pastor Patrick explained that everything that has been called to Be by God first existed in His mind, thoughts, intellect, wisdom and plans, it is then called to Be through His Word and then it becomes what people experience. His plans are powerful and our plans as people are limited because we can only plan as far as what we can see and what we can see is very limited, because that is what God has allowed so we can depend on Him to see the rest of the way. In order for God to move us from what we know and experienced, to what He tells us but do not know, is to follow His Word and His leading. God will ask you to operate from a place of the unknown but God never tells you to do something without having a strategy because His plans are bigger than ours. Pastor Patrick said that Paul said no eye has seen, nor ear has heard nor mind can comprehend what God has in store for us because people would not be able to handle the knowledge and the full extent of the plans which He has for us. This is because they are too deep and too complex to be understood. People always have their plans but God always comes to mess up your plans to bring you closer to your destiny. From the Bible story line he read, he said, “David had plans to bring the ark of the Lord, which is God’s Glory and Presence back into the midst of His people, because whilst he was serving Saul he realized that the presence of the Lord was not there, the question was how was Saul successful without the presence of God? How could Saul lead without acknowledging the God that brought him into the position and Leading a people he never knew or created”. He further explain that Saul never inquired with God himself but rather was consulting the Man of God, Samuel. But when Samuel died, a time came where he needed to hear God speak but God shut his mouth, which led him to inquire through another medium. He explained that “what Saul did not understand was that he was winning all the battles because of who he had in his camp in the form of David whose heart was after God, the anointing was on David to be king from his teenage years but he kept it to himself because when you are anointed you never have to tell anybody, they see it by the giants you face and win. The killing of giants is a sign that God has anointed you”. The key is to always inquire of God on the strategy because it is He who has anointed us to deal with the giants we face. “The threshold for pain varies for everybody because of the various weight we were destined to carry”. He cautioned the congregation from awaiting for approval or affirmation from people and their opinions and in turn be distracted from what God wants them to do. People ought to learn to serve in the midst of “frenemies” because the Judas in the camp brings you closer to your destiny. He also informed the congregation that the word Chabod means to wait or dwell but when the “I” is added the word becomes I-Chabod which means the Glory of the Lord has departed. 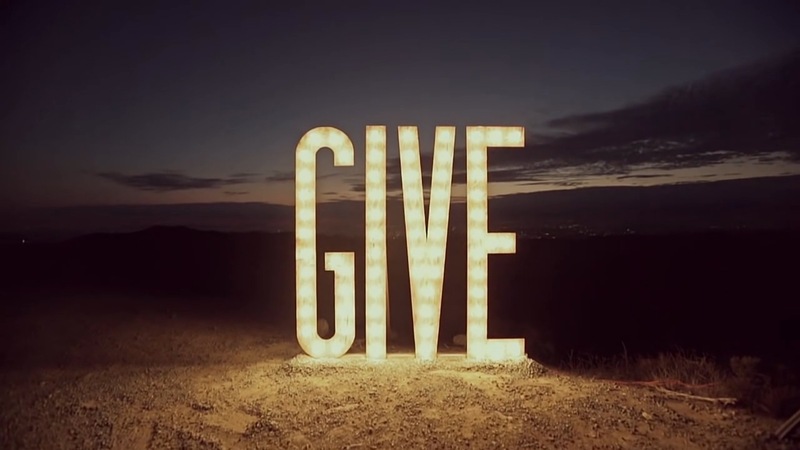 So he cautioned the congregation from putting the “I”, themselves, in situations as they would in turn stand in God’s way of what He wants to do. Pastor Patrick as he draws into conclusion of his sermon, said when David was bringing the Ark back to the people, he said David applied his own plans by using an oxen who later stumbled. The illustration he explained by saying why Churches today are struggling to bring the Glory of God back into Church is because old systems are being used to deal with new stubborn things, people come into Church religiously not to inquire of God for themselves. You have to ask God of His Divine Strategy because the issue we face are too small to define who we are. To inquire you have to use the “Dalent” Hebrew word for door meaning in order to inquire you must enter and then “Rash” meaning the beginning or the head or mind, meaning when you enter you cannot keep your mind, your plans or thoughts, you have to lose your mind in His Presence. “Shith” meaning to be consumed and be fully consumed by what God called you to do. David was consumed by the desire to return the ark and as he studied how it ought to be carried he discovered it was to be carried by Priests on their shoulders. The shoulders however they have to be developed to handle the weight, the Glory of God, and the pressure we experience is to get the shoulders strengthened as we are the head and have to be strong. 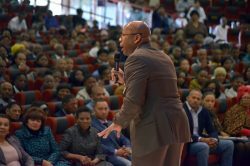 He concluded by saying that Africa should get ready as it is being trained to be used and to carry the weight of God’s Glory. The Ark was to be carried by people not a cart, and this is why the oxen stopped midway, and so they had to be pruned and trained in order not to buckle under the strain.